We recently surveyed our plumbers across all major centres to gain a better understanding of the impact of flexible water hoses or flexi hoses and their contribution to escape of liquid claims. Overwhelmingly all of our plumbers identified that flexi hoses sold outside of specialist plumbing suppliers are the problem. 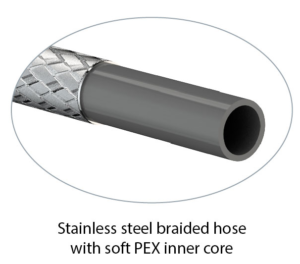 Specialist plumbing suppliers sell flexi-hoses with a stainless steel sleeve and soft PEX inner core that have a 10 year manufacturer’s warranty. On average our plumbers are attending to an average of two flexi-hose failures per month and in some areas more. 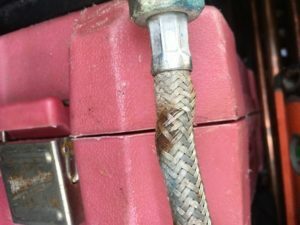 The main issue is where the hose has been twisted or kinked during installation. Mainly in the bathroom, but they are also located in kitchens, laundry’s and toilets. 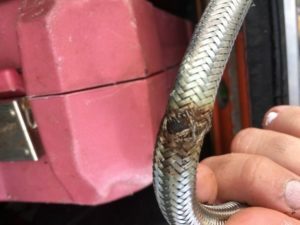 The main reason flexi hoses burst are because of the age of the hose, incorrect installation and damage over time such as corrosion caused by lack of maintenance. This is not an easy question to answer. By virtue of their design and application, flexible hoses solve a number of problems encountered when hard-plumbing with copper pipe. The easy of installation lends itself to the DIY or handyman installer – however they are increasingly failing, mainly because of incorrect installation, causing the pipe to twist or kink, or purchasing the wrong length hose and then stretching or over tightening it to make it fit the application. All of these factors will dramatically reduce the life of the pipe and in many instances void any manufacturer’s warranty on the product. With regular inspection and maintenance most problems can be identified early and prevented. The problem with flexi hoses is they are often out of sight, out of mind. How many are lurking unsupervised in your home?